The SL9000 Series Flow Computers are panel mounted units capable of linearization, temperature compensation for liquids, as well as temperature and pressure compensation for gases. This flexible series of flow computers is fully programmable through the front keypad or with PC based software. 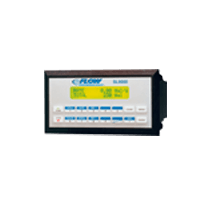 The units can display and provide an analog output in volumetric or mass units of measure. Pulse and relay outputs are available for alarms or batch control.